Roofing Phoenix: Should You Go For a Flat Roof? During house construction, builders typically have two choices on the types of roofing to put on top of the structure—a flat roof or a pitched roof. Of course, key factors to consider when choosing the type of roof include the design of the house or building, applicability of national and local laws, the owner’s budget and location. For those interested to know what type of roofing Phoenix demands for its houses and buildings, particularly the use of flat roofs as a practical roofing design in the area, we compiled a list of the advantages and disadvantages of flat roofs. Based on the pros and cons listed below and considering that Phoenix has an arid weather and experiences mostly sunny days, flat roof is a viable option. Affordable. Cheaper than pitch roof since they use fewer materials and labor. There is also no need for decorative materials, which rack up the cost of roofing. Accessible. Easy to climb on and inspect for regular maintenance because of its very minimal slope and mostly flat area. Applying new coating is easier and cheaper too. Wind Resistant. The flat nature of the roof offers the least wind resistance compared to a pitched roof. This feature is vital during storms when strong winds could rip off tiles and shingles attached to pitched roofs. Extra Space. You can use the roof as an extra space to store materials and supplies. You can even design a green roof or garden on a flat roof. Design Adaptability. Great for small structures such as garages, porches and extensions. They are also the best roof type for buildings and other large structures. Facility of Repairs. Expert roofers can complete full replacement of roof coatings in a single day. Durable. 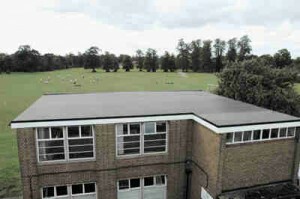 The materials used on flat roofs can withstand ordinary wear and tear and last for up to three decades. Maintenance Needed. It requires regular checkup and maintenance (recoating) to ensure the roof remains leak-free. Potentially Expensive. A flat roof’s coating may require an earlier replacement than pitched fork if not properly maintained, which makes it more expensive than angled roof. Not Snow-Proof. They are unable to withstand the weight of snow accumulation during winter season and heavy rain during storms. Aesthetics. Some people regard certain coating materials used on flat roofs such as synthetic rubber as physically unappealing. Sometimes flat roofs do not harmonize with the general designs of the house in the vicinity. Instability. The larger the area covered by the flat roof, the less stable it becomes.